3/8/19 Congratulations to CannonDesign Chicago and INVISION Architecture of Des Moines for their selection as the winner of the 2019 Learn by Design competition at the SXSWedu Conference in Austin, Texas. I’m very proud to have contributed to the design of the school as a member of The Third Teacher+ team of CannonDesign. My role was to develop and employ strategic ethnography techniques that gave us the right information about the community and its desire to develop a new type of student learning experience so that we could develop the right design. David Jakes Designs has had the opportunity to partner with Kenora Catholic on the redesign of their learning spaces from a classroom model to a studio model. The work involved employing the design process to determine the spatial drivers designed to support that condition and creating a pilot program to facilitate the change. The work has been captured beautifully by VS America in a case study that features our program and outcomes. Read it here. I'm featured in a blog post by Brian Hamm from the American School Foundation of Monterrey (MX) about work I did with them to develop ASFM L2E2, a design process for organizational change nuanced to their school culture. Read it here. 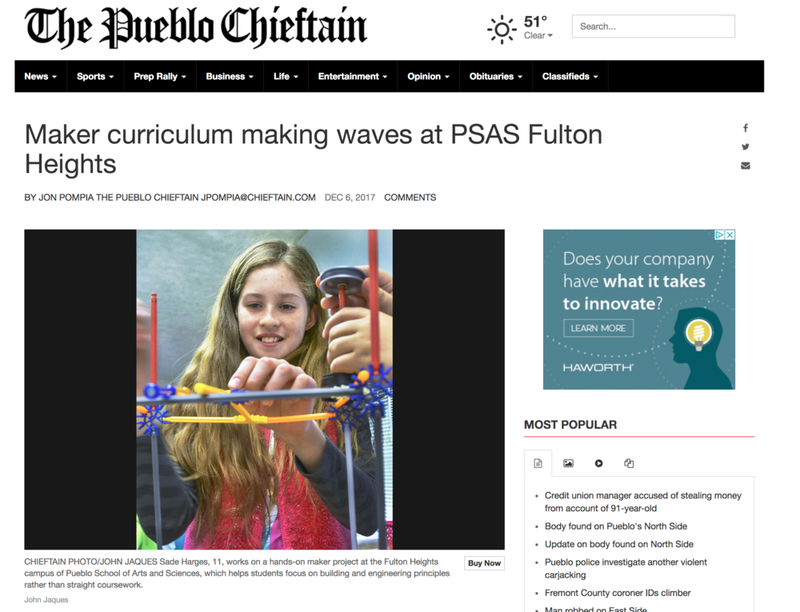 I'm supporting (along with Kevin Jarrett) the work of the administrators and teachers at the Pueblo School for Arts and Sciences - Fulton Heights Campus as they launch a new K-5 school focused on making. The goal: provide an education for the students of a community that will reshape their community. Read the article here.